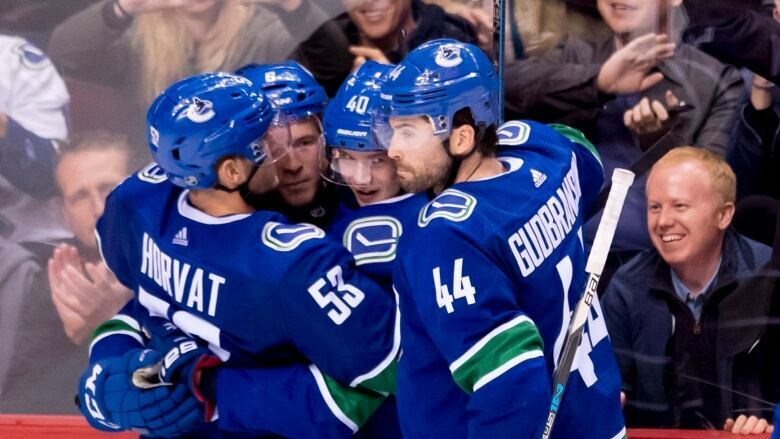 Elias Pettersson scored twice to lead the Vancouver Canucks to a 5-2 win over the Minnesota Wild on Monday. Scoring was nice. Winning was even better for Elias Pettersson. The speedy rookie scored a pair of the goals, the second on a third-period breakaway, to lead the Vancouver Canucks to a 5-2 win over the Minnesota Wild Monday night. The victory snapped a two-game Canucks losing streak and came on the heels of Vancouver's 5-0 loss to the Pittsburgh Penguins Saturday at Rogers Arena. His opening goal came at 6:51 of the second period. He took a pass from defenceman Michael Del Zotto and blew a one-timer past Minnesota goaltender Devan Dubnyk. "If I got the puck I knew I would do a one-timer," said Pettersson. "It was a good pass, right in the wheelhouse." The second goal early in the third had the crowd of 16,546 on their feet cheering. First Pettersson blocked a shot at the blue line. Then Brock Boeser passed the loose puck to the streaking 19-year-old from Sundsvall, Sweden, who beat Dubnyk high on the blocker side. "Good defence leads to good offence, so I want to do what I can do best in the situation," said Pettersson. "In the defensive zone, if you have to block a shot for us to win, you do it." "He's got a really good mind for the game, his details are sharp," said Green. "He understands the defensive side of the game. "He's caught onto it real quick playing centre and he'll be better. He's going to get better in his own zone and he is every game. He's a good player, does a lot of good things." Markus Granlund and Jake Virtanen, on the power play, also scored for the Canucks (7-6-0) who ended the Wild's five-game winning streak. Ben Hutton scored into an empty net with 39.1 seconds remaining. Jordan Greenway, with his first goal in the NHL regular season, and Ryan Sutter, on the power play, scored for the Wild (6-3-2). "You keep doing that too often, I told them, it's going to happen," said Boudreau. "Nobody is able to come back all the time if you're going to start that slow." "To me the third and fourth lines are playing good most nights. I think they deserve to play a little more." The excitement provided by Pettersson helped mask a 37-save performance by Canuck goaltender Jacob Markstrom. "He was great tonight, he wasn't just good," said Green. "They had the heat on us and . . . [Markstrom] was a rock back there." Canuck centre Brandon Sutter left the game early in the second period favouring his right shoulder after falling awkwardly into the boards. "He's hurt and it's not day-to-day, so it will be at least weeks," said Green.